Robert Waryas was a first-time fisherman on a share charter when 23-year-old Capt. Marlin Parker of the ISLANDER hooked him to a piece of history. 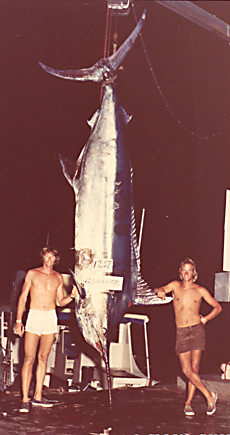 At the time of this capture, this marlin was the largest blue marlin ever taken on 80-lb test line. Robert angled the fish using a Fin-Nor reel after it struck a homemade lure. Douglas Haigh crewed the back deck and made Robert's catch a success.